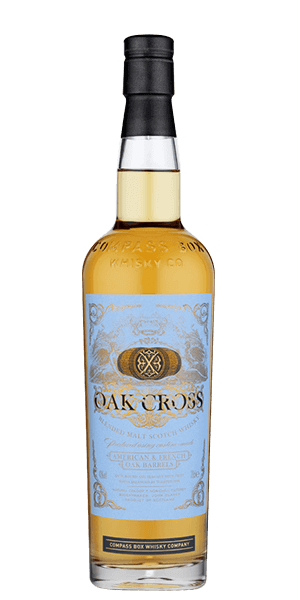 Compass Box Oak Cross is adored for its spicy, clove, sweet vanilla and oak flavor notes. This Scotch is carefully distilled at Compass Box distillery. Based on 65 votes, the average rating for Compass Box Oak Cross is 7.9/10. — My new favorite! Nice start with great finish! — Tasty, not exceptionally peaty. Don't add ice. My new favorite! Nice start with great finish! My least favorite Compass Box that I've tried. A good dram for sure, but not as balanced as their other offerings. This is probably a polarizing whisky. Very strong oaky spiciness and bitterness. You definitely taste the American oak and European oak. That might be perfect for some, but just doesn't align with my palate. Tasty, not exceptionally peaty. Don't add ice. Very smooth enjoyable neat or on the rocks. Will definitely restock the bar with it when it's gone. Subtle with very little bite.